Worrying is a misuse of our imagination. Thanks Mary O’Maley for this reminder. Be imaginatively creating the solutions to life not worrying about the billions of negative possibilities. Brain chemistry, organ functioning, skeletal-muscular strength clearly are assisted by good eating and great movement. Moreover, if your body is sound it is easier to feel the presence of your free and joyous soul. It is no wonder that all spiritual traditions have body-improvement practices. 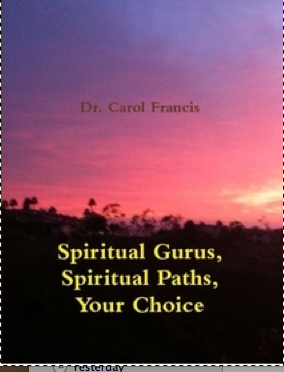 For free chapter from Akashic Records, Shamanic Journeys and Astral Projection by Dr. Carol Francis. For those tuning in to the Merry Medium tonight at 7:00, I will be sending free ebook chapter PDF fashion to those who wish a written discussion on Akashic and Astral Projection work. Please leave your email and Facebook contact and you will be contacted with the materials within 7 days. Thanks. Readings from the Akashic Files!